Funeral companies say they were manipulated into being involved. 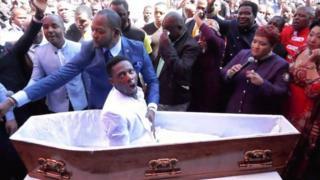 “I’m not here to fight anyone, I’m here to get answers from my fellow brother in the Lord,” Mr Motsoeneng, of the Church of Incredible Happenings, shouts outside Mr Lukau’s church near Johannesburg. South African President Cyril Ramaphosa entered the row on Thursday, saying the government should curb “religious leaders of questionable practices” who took advantage of people.